The Xerox WorkCentre 78XX Series copiers are our favorite in about the last 10 years. The copiers in this family include the Xerox WorkCentre 7835i, WorkCentre 7830i, WorkCentre 7845i and the WorkCentre 7855i. The last 2 digits refer to the copier speed. So the WorkCentre 7845 is 45 pages a minute. 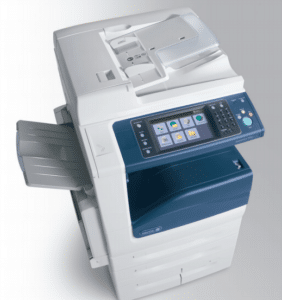 So what makes this copier special or different than other copiers in the same class – Say a Ricoh MP C4504SP, for example. The Xerox with its LED technology allows for thick paper handling and extremely easy to swap out parts. Really, the devices are fairly similar in our opinion. The differences happen with your installation as well as who you choose to work with. We would love to work with your company if you are looking for a Xerox WorkCentre 7845i in Denver, or any copier. Here is a Virtual Demo on the product.